When I voted to remain in the European Union nearly three years ago, I did it based on research. That research told me that the Leave campaign was a blatant right-wing con job. It was, I believed, targeting fertile ground and aiming at people who could be led on impulse. Three years on, after a series of investigations, the Leave campaign has been proven to have lied, cheated and broken election spending rules. The Leave campaign said this was incorrect, so they appealed. Last week, they decided to drop the appeal because they knew they were liars. Included in the lies…sorry, leave campaign, were Tory leadership hopefuls, Michael Gove and Boris Johnson. However, despite all this, I have decided it is time for me and others to join the Leave campaign. I want to be a part of those blinded by the lights of a bizarre form of ‘Stockholm Syndrome’. Well, to me it’s obvious but if you haven’t heard, I will explain. On Friday, during the Brexit march that has cruelly been dubbed ‘The Gammonball Run’, something came to my attention. It was what people describe as a light bulb or hallelujah moment. 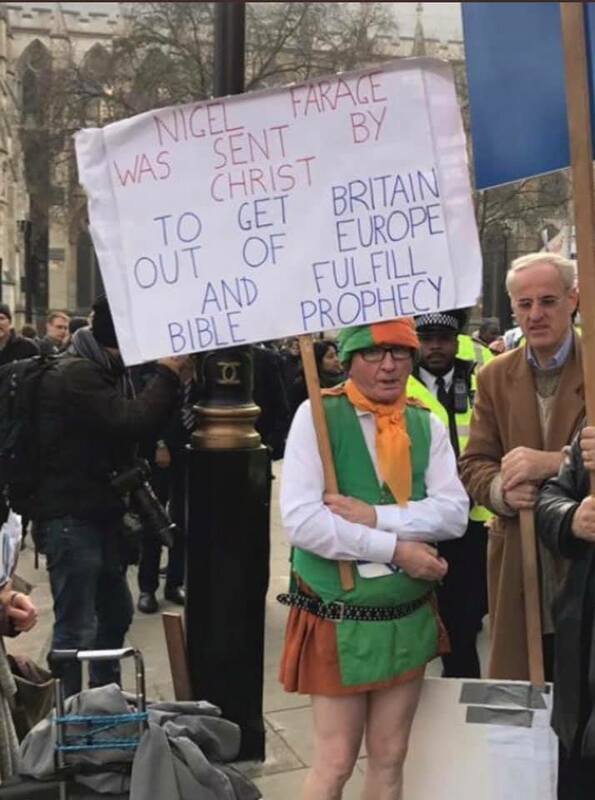 On Friday the 29th March 2019, I learnt that the good Lord Jesus Christ had sent Nigel Farage to save us from the EU to fulfil bible prophecy. Why I hadn’t realised this before, I don’t know. Now I know that Jesus was involved in Brexit and was a Leaver, I am a changed man. Previously, I was apathetic towards Theresa May saying that God (Jesus’s Dad) was guiding her to a good Brexit outcome. Now I know Jesus is involved as well, I can no longer ignore the situation and I will forever look upon Nigel Farage differently. I’ve heard that Jesus was a good man, so there is no way he would send a vile, opportunist, poison dwarf, to sort out Brexit for us. That can mean only one thing. I was wrong about Nigel Farage. It is actually tyrannical Europeans who are evil, not him and the billionaire tax avoiding media tycoons. Murdoch, Desmond, Rothermere and the Barclays are not paying UK corporation tax because simply they do not have the time. They are too busy saving us from the devil who oversees the EU. I always thought that Brexit was a self-serving ideology driven by those who have a lust for selling Britain and its public services to the highest bidder. I always thought it was about billionaires deregulating public services for their own gain whilst conveniently avoiding the 2019 EU legislation on Tax Avoidance. The ERG, Nigel Farage and his angry mob, aren’t tin pot fascists at all. These people are not opportunists using a style of 1930’s populism to create hate and division. These are good Christian men sent to save us from the burning hell that is an economic and geopolitical union with our nearest neighbours. The second coming has been a long wait but at last, the almighty has gifted us with the second son of God. That man is Nigel Farage. No Replies to "Jesus Sends Nigel to Rescue Brexit!"